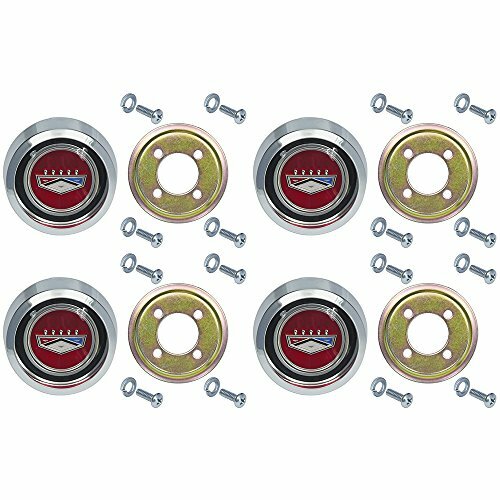 This set of new reproduction wheel center caps fits Mustang / Fairlane / Torino / Ranchero / Falcon / Maverick / full-size Ford / Galaxie; all with Magnum 500 wheels. Set of 4 center caps. Red background with red, white, and blue Ford crown / crest with UV protection. For use on Magnum 500 wheels only. Includes retaining plate and hardware. (Ford part number C9OZ-1130). Over-tightening screws on retainer plates will void factory warranty. Use Permatex ThreadLocker #24200, available at your local auto parts store or Auto Krafters, Inc.
For Magnum 500 wheels. Includes retaining plates and hardware. If you have any questions about this product by Auto Krafters, contact us by completing and submitting the form below. If you are looking for a specif part number, please include it with your message.